One feels sorry for the neighbors of missile-rattling North Korea right now. But as a child of the Cold War part of me would like to say, "Welcome to my world, circa the Reagan years." This was back when US-Soviet relations got uglier than their standard ugliness, and young Charles Cassady would go to bed well and truly wondering whether he'd wake up to radioactive mushroom clouds. For those of you who were too young (or Clevelanders just lost in dope, or disco, or Browns Cardiac Kids mania in this era), the angst went like this: maybe one of the aging Kremlin bigwigs would find out he was terminally ill and would angrily hit the Big Red Button (a right-wing news columnists' 1950s fantasy that I read, I know, but it still stuck with me). Or Nancy Reagan's astrologer would determine via horoscope was a great five-star day to light up the heavens with long-range ICBMs. Or Ronald Reagan's spiritual advisor - Milton Friedman, I believe, was the holy man's name - would sell the rest of the Joint Chiefs on the idea that rebuilding after WWIII would be a boost for big-business capitalism and neocons. All those millions of "DANGER: ATOMIC FALLOUT" and "MASS GRAVE DUMPING ALLOWED" signs that would sell, think of it boys! Especially now that we can make 'em cheaper over the border in Juarez! And if a few small, `stray' American nukes happen to land and detonate in our own heaviest black/Hispanic-concentration slum neighborhoods...that's the benefit of friendly fire for you. 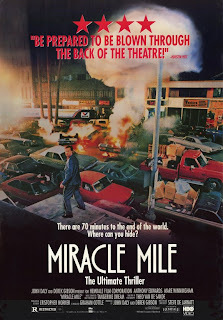 In any case, the movie MIRACLE MILE rose out of this zeitgeist, and for me, anyway, it stands up better than the antinuke TV miniseries THE DAY AFTER. Partially because writer-director Steve De Jarnatt pulls off the brilliant gambit to do the whole thing in real time. We'd all heard the gallows joke the Third World War would last about 87 minutes. Well, here it really does. 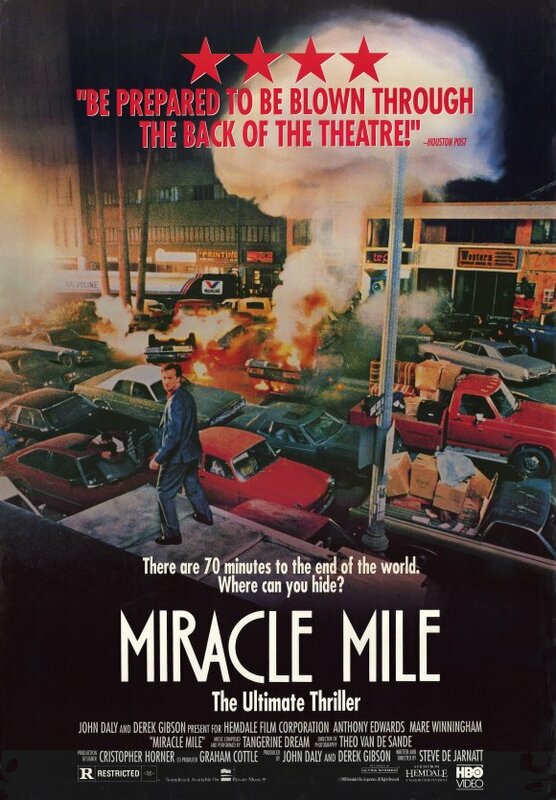 The opening scene has a creation-of-the-universe diorama at a Los Angeles science museum, where a careless cigarette accidentally ignites the fire alarm, which is how a young guy named Harry (Anthony Edwards) scores a fluke hookup with Julie (Mare Winningham), with whom he's immediately smitten. But at a pay phone (remember pay phones?) Harry chances to pick up a wrong-number call. On the other end is a voice claiming to be a frightened young soldier in a US missile silo, trying desperately to reach his family to tell them that launching orders have been given and soon global thermonuclear war will break out. A burst of machine-gun fire heard in the background ends the call (you know, I don't think this movie “Supports the Troops” too much). A shaken Harry reports this to the nearest people, a motley assortment at a late-nite diner, who initially believe it's all a practical joke. But one happens to be a policy wonkette (Denise Crosby, one of several sci-fi genre-leaning actors in small roles throughout), who confirms some of the scant details as possibly authentic. They all scatter, spreading the warning virally through the predawn city. The viewer is pulled along in pure forward momentum, as civilization rapidly unwinds in its literal final hour before one's eyes, either due to the world-of-mouth cascade of doom predicted by the diner occupants, or independent confirmation when it becomes too big a thing to ignore that everyone in the City of Angels will soon be fitted for their harps (damn, out west I would have made a good movie PR hack copywriter. I demand a do-over in my life). As far as Harry, well, now with a very limited deadline, he dashes to and fro on a personal quest to locate Julie before its Too Late and...do what with her exactly? Let's just say the ending doesn't cop out and yet breaks your heart pretty effectively, yet without the sentimentality and tsk-tsking of much of Hollywood’s liberal-progressive antinuke fare (closer to the sardonic edge of DR. STRANGELOVE, in fact). Oh, and a musical score by Tangerine Dream, which is, as they say, to die for.